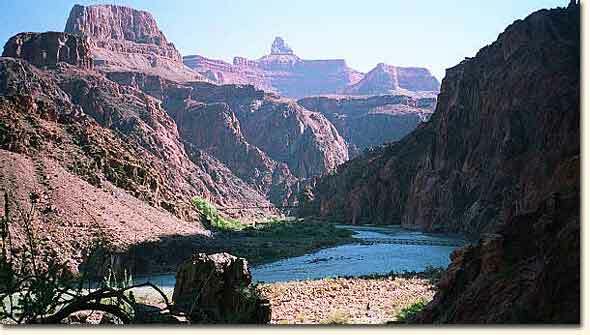 The trail from the Bright Angel Campground takes you to the Colorado River just near where the Creek joins the River. We left our packs at the campground for this short walk. 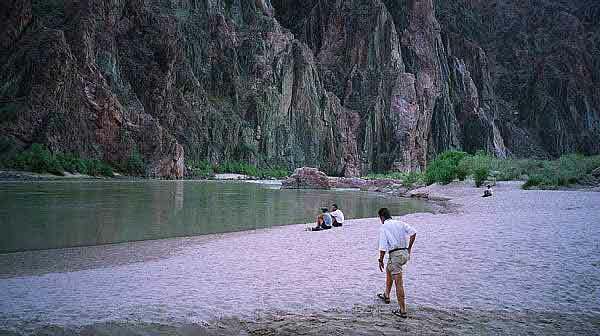 That's Eb walking in front of me and a couple of "communers" sitting near the water. 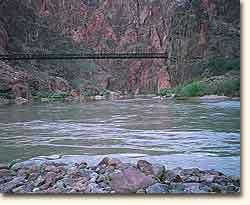 There are two bridges that cross the Colorado here at the bottom, the Black Bridge and the Silver Bridge. 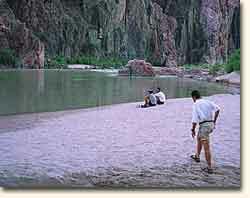 The photo to the left of the Black Bridge is taken from a rocky outcropping that extends almost to the middle of the river. The north side of the Black Bridge appears to end abruptly at the cliff wall. It actually connects to a tunnel entrance blasted in the cliff. 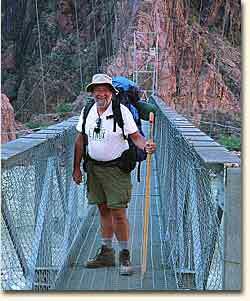 This bridge and path is for the North Kaibab trail. 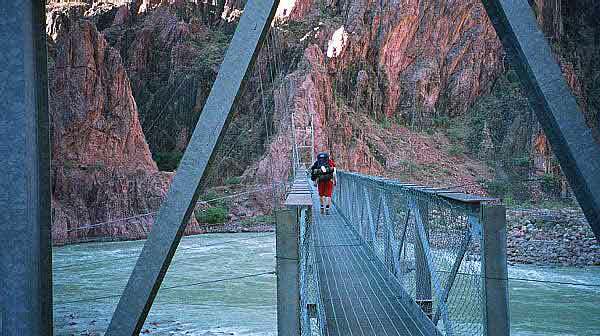 The Bright Angel Trail uses the Silver Bridge, seen here with Ryan at full speed. I almost missed this picture, he was so fast. About 3/4 of the way across, he got slowed down by a couple of slower walkers. 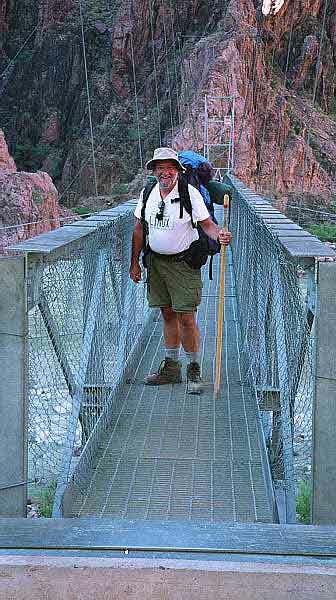 As you can see, its a tight fit to pass someone on this bridge. I think this was the most stressful part of the hike for Ryan; but, he came through famously. Here's another view of the bridge with you-know-who. 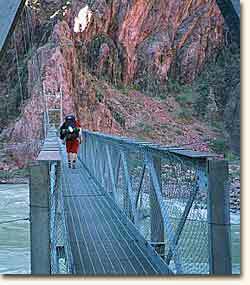 What makes this bridge cool, is that the walkway is grated; you can see right through it to the river underneath. I'm not a great photographer, but sometimes I get lucky. 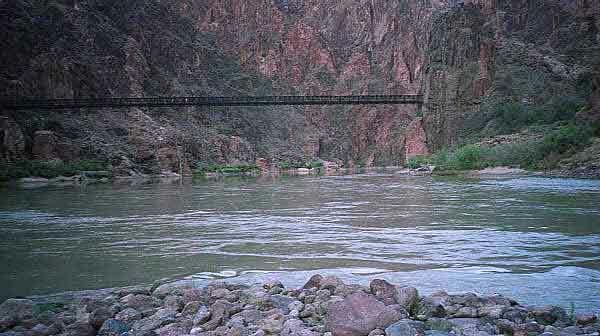 The picture below is a view of both bridges as we start our trip up the Canyon on the Bright Angel Trail. 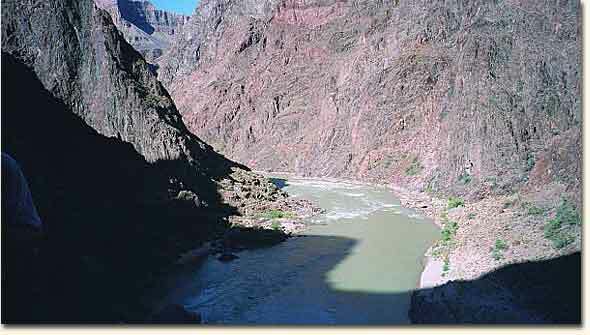 And... another view of the Colorado River as we begin our ascent. Now on to Indian Gardens.